Countdown to the first annual Jazz In July concert happening this weekend in Durban is now underway. Taking place at the Juventus Field at the Botanic Gardens this Sunday (July 2), the festival aims to deliver a supreme and sophisticated outdoor musical experience. The multiple award winning Amanda Black who has already gone platinum with her debut album Amazulu will head the line-up of young talent at the festival. The powerhouse songstress is only 24 years old and has already bagged a South Africa Music Award and Metro FM Award in the past few months. Also representing the young talent is Swazi born muso Sands who has made a name for himself in the SA Jazz/ Afro-pop world. Hit maker of the huge radio tune TIGI, this 27 year old vocalist has already gone Gold in the country. Durban local Lasandra is the youngest artist on the bill. Discovered by Mzansi’s favourite Naimakay, this 14 year-old has the voice of an angel. She is well on her way to making SA fall in love with her. Signed to label Touch Africa Records, she is set to release her debut album before the end of the year. 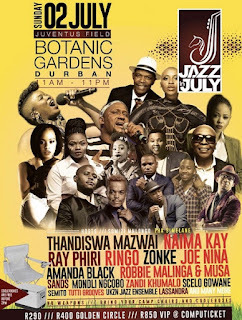 Jazz In July will also feature the legendary Ringo, Ray Phiri, Joe Nina, Robbie Malinga and Thandiswa Mazwai alongside multiple award winners Naima Kay and Zonke. Other headliners include Zandi Khumalo, Scelo Gowane, Mondli Ngcobo, DJ Kotin and the UKZN Jazz Ensemble. The festival will present an interactive and irresistible musical experience using sound, interactive stage, dance, live performances, theatre of the mind and active collaborations of musicians i.e. afro-pop with jazz. Patrons are encouraged to bring along their camping chairs, umbrella’s and cooler boxes (free before 14h00, R100 thereafter) to enjoy the atmosphere whilst taking part in the activities the festival has to offer. Several braai-stands will be available on site so guests are welcome to bring and braai. Hospitality marquees will also be set up for VIP and other guests. The concert takes place from 11h00 to 13h00 on July 2 at Juventus Field, Botanical Gardens, Durban. Tickets still available from R290 (general access), R400 (Golden Circle) or R850 (VIP) from Computicket.